Garmin GPSMAP 276C/278 Motorcycle Power/Audio Bare Wire Cable (010-10587-00) €36.00 - buy online at mysatnav.ie - Ireland's leading GPS & Sat Nav store. 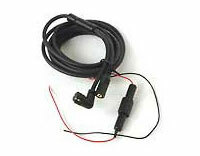 This cable allows you to connect your GPS directly to your car or motorcycle power source. It is bare wired for the power source and also has a 2.5mm audio jack that lets you hear the voice navigation instructions from the GPS. The packag does not include an audio device.